I love a good statement necklace. I also love movies. And I love secretly wearing a costume that no one else knows is a costume. For example, I'll don a bow necklace with a blue check shirt because it makes me think of being The Doctor in the Tardis. 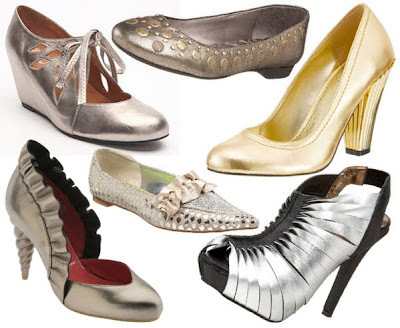 Fashion is supposed to be fun right? 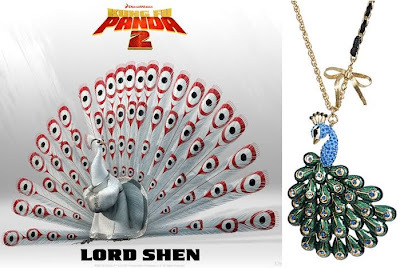 I was going to do a plain old statement necklace post for you today, but I kept finding necklaces that reminded me of movies. 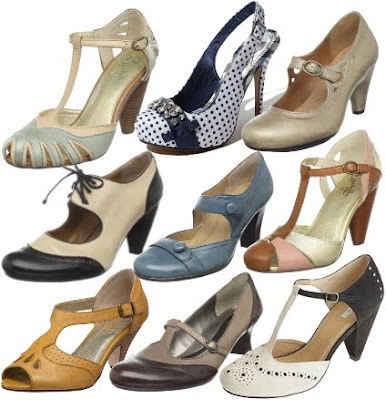 If you spot me wearing any of these you'll know I'm in one of my secret costumes that day. I'm very excited for The Hunger Games movies (casting disappointments aside). Katniss Everdeen takes on death with her silver bow and arrows. 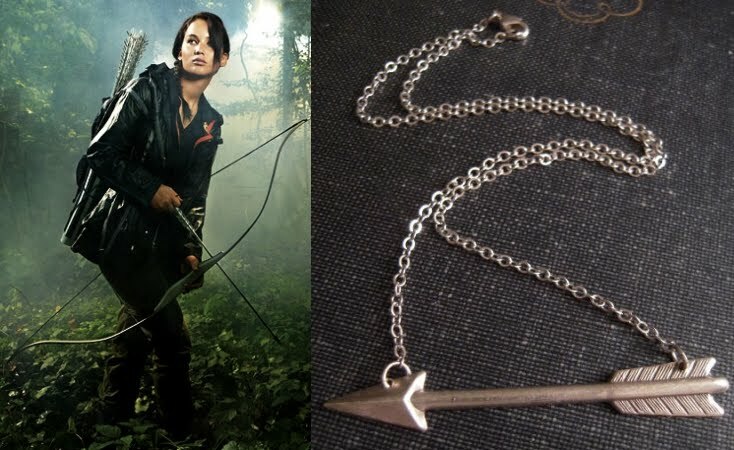 I'd wear this silver arrow necklace ($16, Etsy) with a braid and lace-up boots. I was always frustrated by the lack of female Jedi in the original Star Wars movies. Of course, I eventually decided I wanted to be Han Solo with a light saber even if that's not how it works. 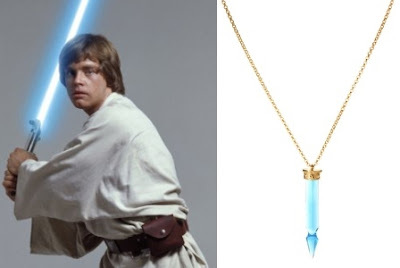 I'd wear this light saber-like spear pendant ($13.79, ASOS) with my best rogue, space captain attire. I adore Winnie the Pooh (and Eeyore too). I really want to see the new movie, but I couldn't convince anyone to join me. Oh well. 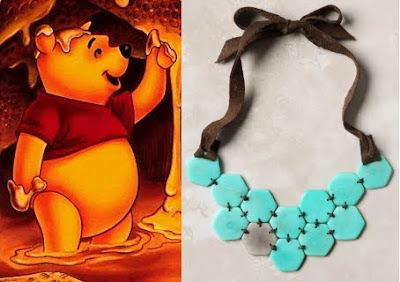 I'll have to watch it alone while wearing this honeycomb necklace ($88, Anthropologie) and a red shirt. I love the Harry Potter books, but I read them somewhat recently so I've never seen any of the movies (I have to do things in order). I really do want my very own owl, though. 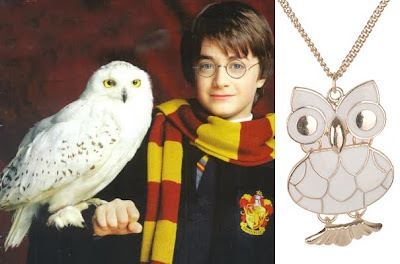 This owl necklace ($2.80, Forever 21) is probably the closest I'm going to get to having a Hedwig. My cousin's husband loves Kung Fu Panda and is shocked that I've never seen it. 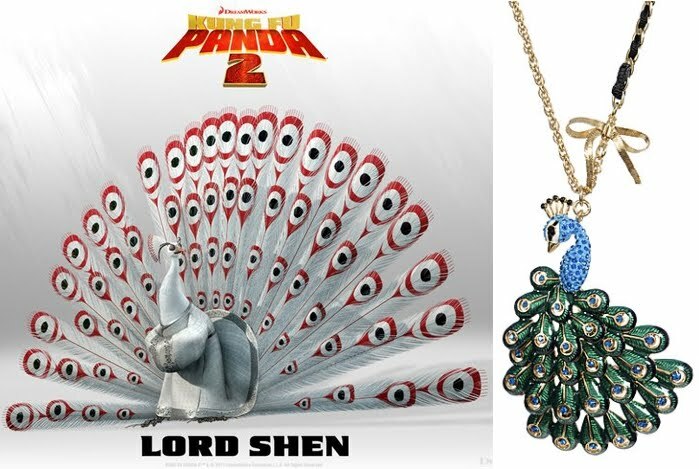 Knowing that the second movie has an evil ninja peacock has piqued my interest though, as has this awesome peacock pendant ($50, Lord & Taylor). 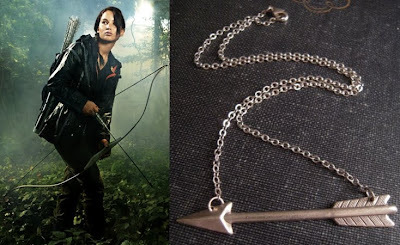 What movie would you want a necklace for? Hunger Games casting disappointments? What? Lenny Kravitz as Cinna is GENIUS!! On a different note, there really needs to be a sarcasm font.